IN A NUTSHELL: I've made my own Oracle Deck system based off of the Tarot - and I'm sharing this system for FREE under a Creative Commons license. WHY FREE? : I'm releasing this under a Creative Commons license because I would love to see this system widely adopted. If a variety of artists use this system to create Oracle decks that would be a lovely thing, we'd have some semblance of familiarity with at least a portion of the Oracle decks on the market, and EVEN BETTER - readers could mix and match their decks, selecting their favorite cards for each archetype and customizing a deck for their own use. HEY ARTISTS: I know a lot of artists that find Tarot fascinating. Many of us have ambitions/fantasies of creating our own deck. But creating a deck of 78 original works of art is a daunting task. It can take years to finish the art for a Tarot deck. The Major Arcana offer layers of symbolism and diverse imagery, a joy to paint but the suits are full of monotony. Because of this many artists resort to creating an Oracle deck instead of Tarot. But there are issues with Oracle decks. There is no standardization with Oracle decks, unlike Tarot which you can count on to have the same cards, with the same meanings, despite a change in artistic style. Because of this lack of standardization a reader might be learning a new system with EVERY Oracle deck they buy. I find I long for the familiarity of Tarot whenever I'm playing with an Oracle deck. I know the Tarot system so well that I instinctively look for parallels in oracle systems. I've not found an oracle deck yet that made this easy. So what's a lazy artist to do? I'd love to create a Tarot deck. I don't want to paint 78 cards. I certainly don't want to paint the boring cards….. Necessity is the mother of invention as they say - so I created my own Oracle system based off of Tarot. I've been using it for years. I've given it to friends to try out. It's easy. It works. I'm sharing it now with you - for free. I'm releasing the Ashwood Tarot Oracle under a Creative Commons license. You can use it for personal or commercial use to create your own decks. You don't have to pay me to use. BUT you do have to give me credit. More about that later. The main point here is FREE!! HEY NON-ARTISTS: This is still for you! Even if you have no ambitions to paint your own cards. Guess what? You can still use this system. Using my Tarot Oracle system as a guide you can MAKE YOUR OWN DECK. Just find images that match the energies and themes of each card, and create your own deck. Awesome, a custom deck all your own... FREE! INTRO: This system relies heavily on its association with the Major Arcana. There is much tradition in creating an Oracle deck that mainly consists in associations with the Major Arcana. The earliest Tarot Decks featured only the Trump cards - the Major Arcana, with the suits following in later adaptations. Indeed to this day there are many readers who work with Major Arcana only when doing readings. However this deck does accommodate the minor Arcana as well thru the use of an Elemental suit. EXTRAS: This Oracle deck uses a 14-sided die and a Polarity Coin for readings. These props are not necessary, readers can rely on their intuition, but are a helpful addition for readers that are interested in fine tuning a reading. From a creative standpoint the Polarity Coin and the Dice offer another opportunity to customize the deck according to your own aesthetics. DIE: The 14-sided die provides number associations with each card. Clearly the pip cards in the suits are numbered 1-10, but the rest of the Tarot has numerological associations as well and the dice can be used to further deepen a reading. Twenty-two cards of the ASHWOOD TAROT ORACLE correspond with the twenty-two cards of the major arcana of the Tarot. The cards represent timeless archetypes and are powerful divining tools. In the creation of this deck I strove to break down each card of the Tarot's major arcana into the essence of it's archetype. Artist's painting these cards can feel free to draw upon the traditional symbolism of the classic Tarot cards, or explore their own unique take on the card's energy. However care should be taken that the point of this system is that the reader should be able to use the card's Tarot based correspondence to rely on an instant connection to the card. On the left is the name of the card in the Ashwood Tarot Oracle System - on the right is the name of the card as found in the Major Arcana of the Traditional Tarot Deck. Five cards are added to the 22 archetype cards to represent the 5 elements of Earth, Air, Fire, Water and Spirit. Four of these can be used to represent the elements associated with the four suits of the Tarot. Spirit (card title – The Divine), while not represented via a suit in the traditional Tarot is still a powerful card in representing our relationship with the divine and can be freely used in the same manner as if it were a suit of its own. There is great benefit to breaking the suits down into their elements. For years debate has raged in the Tarot community as to the original elemental associations of Swords/Air Wands/Fire - Many reverse these associations. Using the Ashwood Tarot Oracle system removes the association completely, and these suits are represented solely as their elements. PIPS: When reading an Oracle Deck based on this system the reader will use a set of dice. To fine tune a reading and explore cards 1-10 in the suits, a reader simply pulls an elemental card from the deck and rolls the dice to find it’s numerical accompaniment. This number will give the reader the cards correspondent in the Tarot. So for instance pulling the Imagination card (Element Air) and rolling the dice for a result of three would be the 3 of Swords in Traditional Tarot. To further fine tune the interpretation of this card the reader flips the polarity coin. Three additional cards reside with the 22 Cards of the Archetype Suit. These are the Wildcards and have been added to specifically address issues that are frequently found in divinatory readings. Choice, Mystery and Passion each address specific needs. These are issues that often come up in a reading yet do not have a clear and dedicated corresponding card in the traditional Tarot. Mystery – The Unknown, this just isn't knowable right now. Akin to the Magic 8 Ball answer of "ask again later"
Passion – Desire, is there to much or too little of this emotion at play in this situation? I'll be adding more resources to this page in the future. Correspondences, symbolism, reference material etc are all forthcoming. 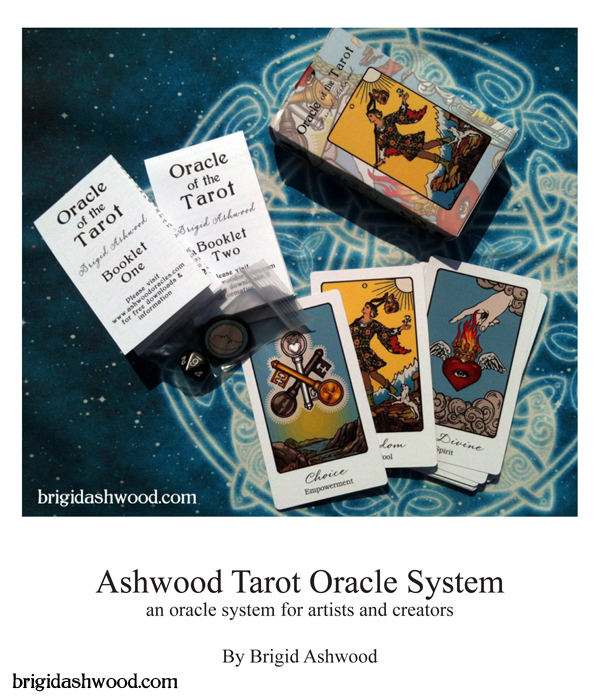 Ashwood Tarot Oracle System by Brigid Ashwood is licensed under a Creative Commons Attribution 3.0 Unported License. You are free to change and adapt the system to your needs. HOWEVER you must indicate the changes made if you are publishing the resulting materials. You may not sell the system as is, or take credit for it as your own. PRINT PUBLISHING: If you use this system to create a deck and you subsequently publish it as a printed deck for sale to the public, you do not have to pay me any royalty. HOWEVER, I ask that you contact me first and inform me, and I do require a credit to me in the printed materials.